World Zakat Forum is a form of awareness to organize various related zakat elements institutionally and formally by gathering and networking them in one single room with intentions to develop world-widely practice of zakat, to manage it properly, and to distribute it accordingly. In line with multi-dynamics of problem occurred in many places dispersedly, from Sudan to Indonesia and from Syria to Kazakhstan, a formation of World Zakat Forum should ideally be an institutional platform to formulate effective solutions in several concerned questions: first, the main essence of zakat should not only be to eradicate poverty and disability, but particularly also for the empowerment of ummat; second, to alleviate social-economic difficulties among ummat; third, to deliver welfare of ummat; fourth, to lift up Muslim world leverage, and; fifth, to revive a glorification of Islam at many different aspects globally. Amid the uncertainty situation, mostly on social economic aspects globally, Islamic World should have had a room where ummat’s interests can properly be applied, together with how Islamic world will able to contribute at global world and mankind as a part of universal solidarity (ukhuwah wathoniyah and basyariyah) along with ukhuwah islamiyah and ukhuwah insaniyah. As a part of consolidated common dream and forging a solidarity, World Zakat Forum has organized a series of conference in New York, Banda Aceh, and Kuala Lumpur since its first formation in Yogyakarta in 2010. 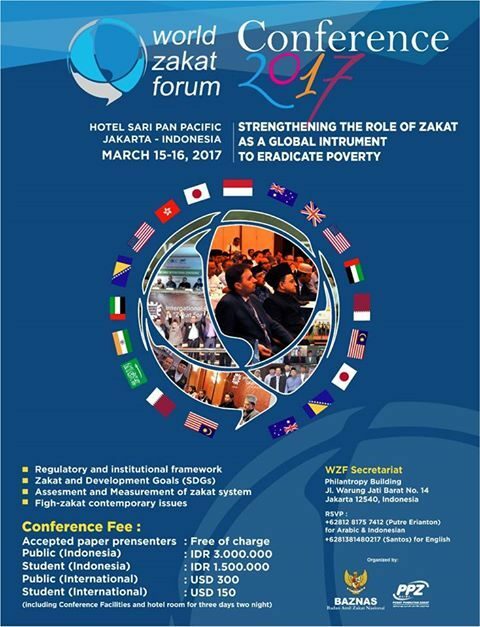 Preceding the 2017 event in Cape Town, in the month of April, the next close-coming event in Jakarta that will be expected to affirm a role of World Zakat Forum in taking part at any global efforts for relieving social economic complication, including particularly a poverty, in many different parts of the earth while revitalizing the peaceful face, heart and mind of Muslim world. As previously explained, Islamic world has been facing with multi-dynamic problems and challenges at either externally or internally, especially post-Cold War at the last twenty decades respectively when the relationship of West and Muslim World has been tainted with a tendency of misplacing trust and stereotype, and the rise of non-traditional threat on human security in which disaster becomes a part of. Internally, many Muslim countries undergo an uncertainty at many of their multi-domestic aspects, mostly human security with its management. To respond the situation, global zakat movement can take significant roles to contribute, distribute, by providing a helping hand for those who are ill-fated at both financially and non-financially by eradicating it, plus also supporting the rebuilding human basic aspects, such as health sector, and education. In this matter, world zakat community takes part in a global solidarity for humanitarian action in order to revitalize Muslim World’s standing in global solution and human prosperity, to strengthen Muslim World’s leverage, plus to overcome a tendency of stereotype as a part of global campaign to revive a glorification of Islam. 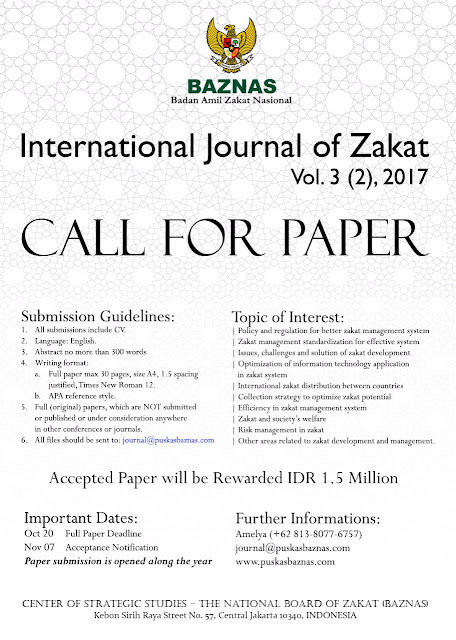 Apart from these issues, mechanism of zakat still needs a serious attention to seek a solution related to précised comprehension of Fiqh, management models, inter-country distribution of zakat, the mechanism of cooperation in zakat practices related to diplomatic issues, and other concerned issues that will need to answer. As a matter of fact, world poverty is found in many Muslim world from the west of Africa in Mauritania to the east in Indonesia, from the north in Kazakhstan to the south in Comorro Islands. The high level of poverty among Muslims countries has obviously been weakening the position of Muslim World, aggarvated with backwardness at the education sector, inferiority in science and technology, plus less capacity of suprastructure and human resources. As a part to answer these various problems, the presence of zakat should be underlined as a strategic modality for Muslim World to release themselves of any long-term dependence from western countries or any from northern hemisphere that becomes a prolongation of colonisation at many occasssion in a new face. The resurrection of Muslim World must start from the success on how to settle the problems of umat indepedently, autonomously among Muslim World themselves by strengthening the role of zakat as ‘a social-economic weapon’ that can then be used as ‘political arm’ to in facing capitalism, and liberalism. The use of zakat must have a strategic significance to reinforce ukhuwah, coolaboration, and solidarity among Muslim Nations to reach common goals. To reinforce a common solidarity among world zakat community in facing new challenges for Muslim Nations, including how to balancing western world as a rampart of capitalism and liberalism. These five motives of event might expectedly enable the conference to have a significant meaning with strategic points addressed to reply current international issues concerning both social-economic issues, and political questions. To engage press and media as a part of universal campaign, promotion, and socialization towards global society. Further, the conference will practically be an instrument of both consolidation and reinforcement among member institutions from different countries, as well as an instrument of intellectuality and an instrument of promotion and dissemination too by bringing press and media into.